A chainsaw is one of the most dangerous single things on this planet. A roaring machine cycle of sharp teeth created to cut anything down.When using a chainsaw, an important aspect of the process is not catching any of your own bits with the blade. Along with standard caution, you’ll also want some safety chaps for your legs because you know what happens if you’re not wearing them and you slip? 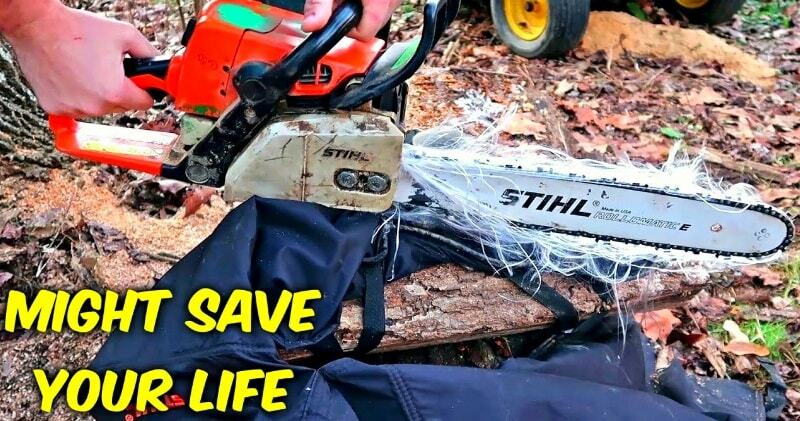 Nothing good.So take a look at the video from the Crazy Russian Hacker as he takes on the challenge of putting a chainsaw up against a pair of chainsaw-resistant pants.via(speedsociety). Now, he says that he has used them before in a demonstration like this and it worked but this time, the goal is to put the chainsaw up against a slow motion camera to see how exactly these pants work when they’re struck with the blow of the chain. Essentially, the goal of it all is to slowly tear apart the pants as to jam the chainsaw, disallowing it to continue rolling straight through your leg.I can almost guarantee that you’ll want a pair of these if you ever plan on using a chainsaw in the future. They do such an effective job of stopping that saw in its tracks and it’s almost a no-brainer that you’re going to want to use them!